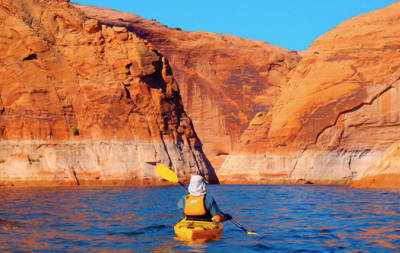 Easy paddling each day with lots of breaks for relaxing, swimming, and stretching. Meals, lodging, kayaks, paddling gear, permits, all ground van support, and two Local Adventures in Florida guides. Leave winter’s blast behind, grab your binoculars, and head to Central Florida for a week of serious birding, playful paddles, and a trip to the Space Coast Birding and Wildlife Festival. Our home base will be the cabins located at Blue Springs State Park — the epicenter of coastal and Central Florida birding. 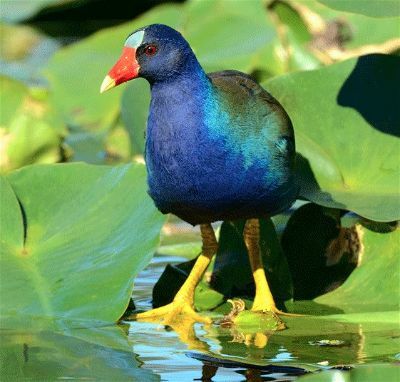 Each day will include a short passenger-van drive to one of many aquatic habitats — swamps, bayous, estuaries, rivers, and springs; the main activity will be birding, but we will also take time to kayak, hike, swim, and snorkel. Spare time at Blue Springs can be filled with hiking; walking to the boardwalk that overlooks the warm waters, where over 200 manatees wintered last year; or reading in a rocking chair on the screen porch of your cabin. The pace throughout will be relaxed enough for plenty of birding, sightseeing, nature walks, and just sitting back and reflecting. Enjoy a different birding experience every day and return each night to the comfort of your cabin, where the trip leaders prepare all your meals. Day 1 — Once everyone arrives and gets settled in, the guides will go over introductions and the week’s agenda. After our first dinner together, we can walk the spring run and become introduced to the increasing manatee population at Blue Spring. For those folks who need to really stretch their legs, there are several miles of hiking trails that border swamps, scrub forest, and long grass/cane prairies. 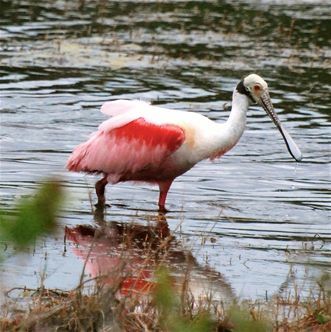 Day 2 — Today, we’ll head to Merritt Island National Wildlife Refuge, the greatest place in Florida for birding and wildlife viewing. There is so much — it just seems too easy. 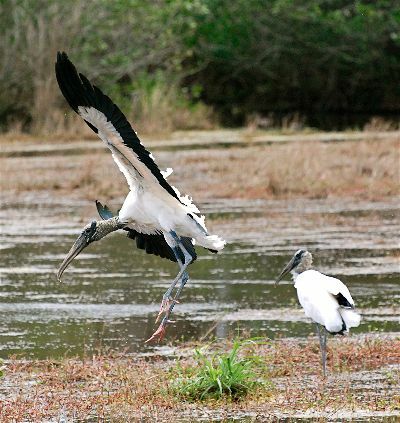 You will find yourself scant feet away from rosette spoonbills, glossy ibis, reddish egrets, wood storks, bald eagles, and countless species of migrating ducks. After lunch we will visit the Space Coast Birding and Wildlife Festival. Be prepared. 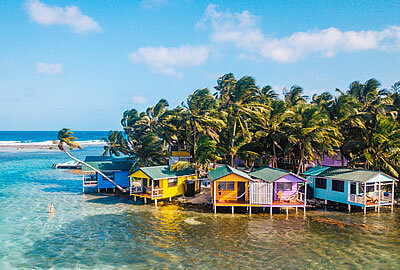 • Brackish waterways winding through palm and oak hammocks, pine forests and flat woods, and coastal dunes. • Major wintering area for migratory birds with several wading bird rookeries, and many bald eagle and osprey nests. • Home to a large population of Florida Scrub Jays and 14 other threatened or endangered species. • Black Pointe Wildlife drive. As good as birding gets. Day 3 — We’ll begin with an early morning departure so we can visit the old sugar mill, where we’ll make our own pancakes at our tables, and then swim off all the maple syrup in De Leon spring, proclaimed the fountain of youth by famous explorer Ponce de Leon. We can swim and snorkel until its magical powers reveal themselves. Paddling the surrounding National Wildlife Refuge will offer great views of the enormous wintering population of migratory birds. • Whole-grain pancake breakfast in The Old Spanish Sugar Mill. 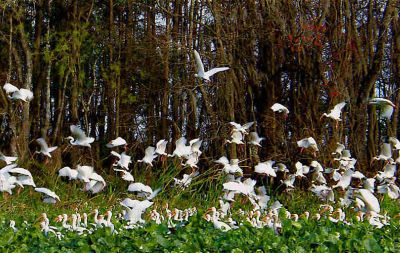 • Five-mile stretch of the Great Florida Birding Trail. Day 4 — A little bit longer of a drive today, however, the pay-off is huge. We’ll begin by snorkeling and exploring a wonderful second magnitude spring. 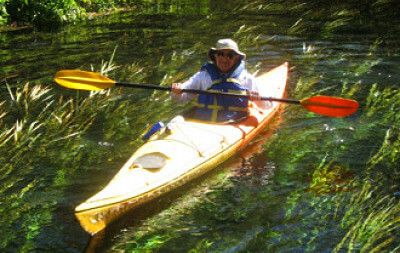 Afterward we’ll navigate our kayaks down the extremely narrow gin-clear waters snaking through the sub-tropical Juniper Springs National Wilderness area. • Excellent brush land environment, home to the endangered Florida Scrub Jay. 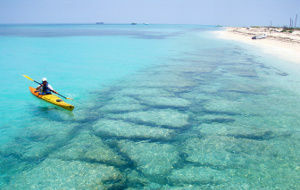 • Narrow, winding, crystal waters through a lush, designated wilderness area. • Up-close and personal photo opportunities with massive Florida alligators. • Likely sightings of deer, otter, and perhaps even the Florida Black Bear. Day 5 — This morning we’ll pack our picnic lunches, grab our kayaks, and paddle the short distance north (downstream) a few miles to Hontoon Island S.P. This area of river is packed with manatee, otter, and sun-worshipping gators. Overhead, bald eagles, ospreys, and red-shouldered hawks scan the water and marshes for their next meal. On and near the riverbanks parade large wading birds, coots, moorhens, and the occasional wild hog. Our destination is Hontoon Island, which has a wonderful nature trail that leads to an ancient Indian shell mound. The park is also famous for its large owl population and extensive Indian artifacts, including the state’s largest totem pole. We will spend a good part of the day hiking the island in search of birds and other wildlife. 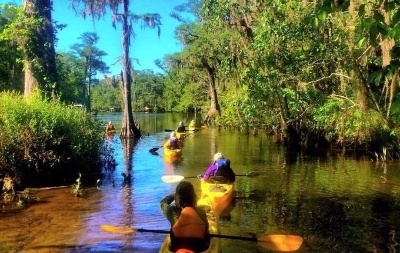 Once we return to our lodge, anyone with enough energy can take the short shuttle with the trip leaders to the Lower Wekiva River State Preserve for a three-hour paddle down the Wekiva River, past Blackwater Creek, and the confluence with the St. Johns River. This small stretch of river contains large concentrations of wildlife. For many this will be the highlight of the entire trip. Expect a huge dinner after this enormous day of activities. • Timucuan Indian mounds overlooking Lost Man’s River. • Pine flatwood, palm/oak hammock, cypress swamp, and marsh habitats. • Barred owls, bobcats, and other reclusive wildlife abound. • One of the world’s laziest rivers, the Saint Johns. Day 6 — Today will find us at two very special places. 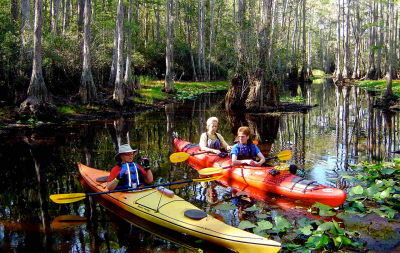 Our first stop will be the Econlockhatchee River and the Little Big Econ Wilderness Area. 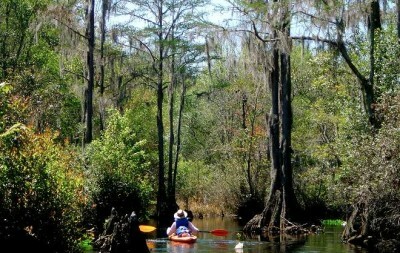 We will paddle about eight miles through a mysterious moss-covered cypress forest. This tightly winding river twists its way through sloughs, swamps, and prairies, eventually becoming a widening lazy river. On our way we will encounter bald eagles, osprey, numerous hawks, swallow tail kites, otters, and of course the American alligator. Lunch and a swim await us at my favorite swim hole along the Florida National Scenic Trail. After a great paddle we will travel the short distance to the Orlando Wetlands Park, which draws in birders from around the globe — after a few minutes on any of the hiking trails there you will know why. After we finish up playing we will go out for a farewell dinner then drop folks off at the airport or a near by hotel. Flights should be booked for early Saturday morning.